Hands up who likes to indulge in a cheeky takeaway from time to time? My hand is firmly up and waving around in a very keen fashion! I'm not sure about you but I never seem to learn when it comes to takeouts, each time I decide it's a good idea i'm left feeling uncomfortably full and slightly dirty! We're talking fattening Indian takeaways laden with coconut milk or oily grease ridden pizza. It's a good idea in theory but once consumed you don't feel so hot! 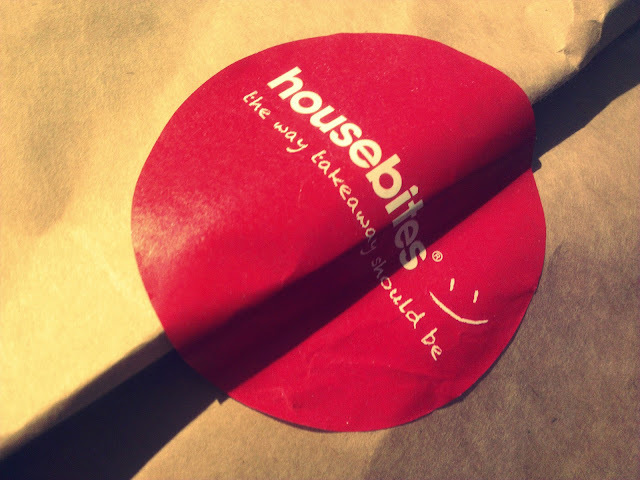 Well I have a solution to this dilemma ... let me introduce you to Housebites, restaurant-worthy gourmet food from the comfort of your home! Despite it having been around for a while now, I only heard about the posh nosh takeaway service few months ago and have been hungry to try it ever since! Well last weekend, a girlfriend came round and we took the plunge and what a plunge it was! Let me explain the Housebites service in simple terms. Professional chefs living in London, Manchester, Bristol and Brighton place their personalised bespoke menus via the Housebites site. Every chef cooks and delivers within a certain radius (I think it's about 2-3 miles max). All customers have to do is sign up and enter their postcode. Bam! Up pop a list of chef options (complete with a sweet little profile on each) and menus for each to choose from. Once the order has been placed the chosen chef gets sent all the necessary details and gets cracking to deliver a delicious meal on time. We opted for the delightful Parisian treat, Lena! Her Housebites profile says she draws inspiration from her French and Persian heritages and her menu puts a quirky spin on Middle Eastern classics. So far so good, plus I feel like I know the chef preparing my meal which added a whole new dimension to the normal takeaway experience. Lena's menu consisted of four mains, three sides and one dessert - small but perfectly formed. There's nothing worse than a menu as long as your arm, I would much rather have a few options to choose from - the sign of a good restaurant or chef in my opinion. So onto the food ... to start us off, we snapped up two portions of Lena's tangy tangerine hummus and pitta. 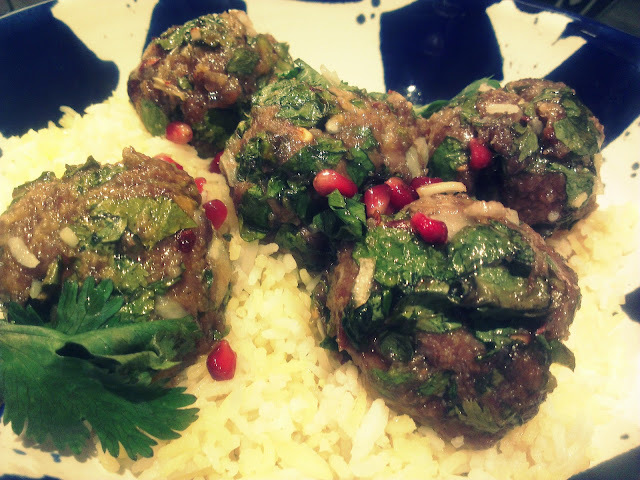 Mini mouse and I then opted for the 'Persepolis Kofteh' for our main course - organic lamb and pistachio meatballs baked in a luscious pomegranate and honey glaze, sprinkled with pomegranate seeds and fresh coriander served with aromatic, buttery saffron rice. 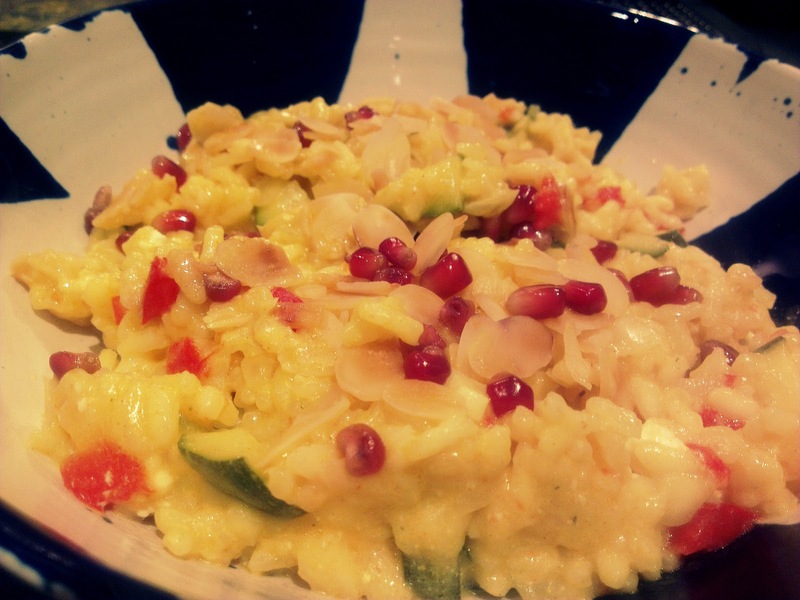 Being a veggie, Ellie Mouse went for Middle-Eastern Style Risotto - creamy courgette and red pepper risotto with parmesan and feta cheese, flavoured with saffron, lemon and a touch of chilli, topped off with toasted almonds and pomegranate seeds. Once ordered, we were then prompted to select a delivery time ahead of paying up. The whole process was complete plain sailing and ridiculously affordable - just £35 for a gourmet takeaway ... amazing! We then sat tight until our time slot arrived, which was between 9-9.30pm - bang on 9pm my mobile sprang into life and hey presto, grub was up! I scampered to the door and was met by a smiling face holding out a brown bag of goodness. It was like Christmas! I rushed into the kitchen and the girls followed. We ripped open the bag to find our dinner neatly stacked up waiting to be devoured. We started with the hummus which was out of this world, so flavoursome and full of texture and the pitta still piping hot, the beauty of your personal chef living just a stone's throw away! After gobbling that down we greedily dished up our mains which were meet with a series of OMG's ... seriously tasty stuff! All in all, a revolutionary find that has changed my takeaway outlook for life! I know what i'll be doing next weekend, the following weekend and the weekend after that. My parting words for you are simply ... Housebites rocks!